An essential component of The Circle Way, the check-in is also one of the easiest and most effective ways to begin to apply The Circle Way. This month, both our story and tips offer fulsome descriptions. Below, Amanda Fenton, The Circle Way practitioner, teacher and board member, describes how crafting a timely and responsive question for a structured online space helped an international gathering arrive and step into their learning together. It was the second class of The Circle Way: A Four Week Online Class to Introduce and Nuance the Components Wheel, co-hosted by Tenneson Woolf and myself. We were a group from all around the globe - Japan, Liberia, Luxembourg, Spain, Canada, and a number from the United States. When I woke up that Wednesday morning, my mind wandered over our planned check-in question. The news that week in North America in particular was filled with stories, protests, and other collective action about children being separated from their families due to a US government policy change that immigration violations previously as treated as civil offenses were now criminal offenses – even crossers who may be asylum seekers. We welcomed the group by sharing a photo from last summer’s practicum on Whidbey Island, to help us sense into the energetics of circle in our virtual format, the connection to a visible centre and the rim of chairs. After some framing on the day’s class (the theme was “Sharing Responsibility in the Circle”) and a start-point offered by one of the participants, we shifted to our check-in. 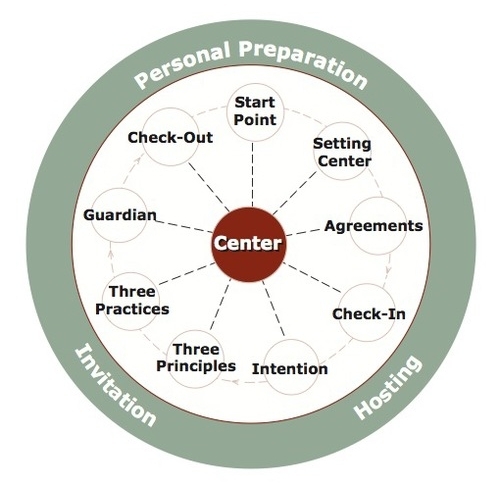 One person offers to host the process - guide the circle through the rounds below. One person offers to guardian the energy, time, focus and need for pause. Use a gentle sound-maker, if you have one. Pattern of the bells: ring – hold a few seconds of silence – ring, then share a short sentence why you paused the action. Choose a host and guardian. Host shares the check-in question to begin the round. Whoever is ready to speak can begin by picking up the virtual talking piece and when complete, return it to the centre. Check-in question: As you arrive onto our call today, what words would you use to describe where your head is? And where your heart is? After the check-in in small circles, we returned to the large circle for a few reflections to help weave the whole. One of the themes was appreciating the check-in question and the time for more individual sharing; some had arrived feeling ‘heavy hearted’ that day, and the check-in helped them authentically speak to what was going on for them. It was enough to speak it, let it rest in the centre, and be able to shift to our agenda for the day. I love the power of this particular check-in question and how it also cultivates our circle skills. To acknowledge the humanity of what we arrive with, instead of requiring I park parts of myself ‘at the door’. To rely on our marvellous ability as humans to hold multiple attention points at the same time. I can be angry and sad about current events, and I can be curious and ready to be in a learning space together. I can hear others’ emotion and expression, and I can give them witness with my listening and presence without needing to jump into my own story-sharing or opinionizing. Our words and feelings can go into the centre instead of onto each other. We can hold space for the range of how we each show up; some joyful, some sad, some anxious, some with other matters weighing on them… we make visible that we’re each having a unique human experience. It is remarkable for a group of near-strangers, who had only spent 2 hours with each other the week before, to experience a sense of intimacy and vulnerability inside a 15-minute check-in, by sharing a bit from their heads and hearts. I appreciate how the components of The Circle Way work together to create the container for this quality of connection to emerge. Remarkable yes, but not unusual with circle. "In our training for international students in a Japanese university last weekends, I experimented check-in for the first time with the trainer team. Normally, we would just jump into action according to a plan we set before-hand. I wanted to do something different that made people feel that they play an interconnected part in creating the container for these students to learn and feel a sense of belonging to the whole. I came up with a question that asks people to think about their intention for the day: "As a trainer, what do you want the students to feel/to realize today?" One thing I have come to realize since joining the class is that I can lean on some components of the circle to create a clearer sense of purpose and connection. With that, a question comes as a critical part, an invisible center, that helps people think together and share together. And as a "host", I found it necessary to ask myself constantly, "what could I do at this moment in time to show people that they are in unity?" Thank you Nam, and thank you to all the other participants of the online class for helping to deepen and nuance the meaning and potential in the components wheel. Bonus: Here is a collection of check-in questions - may they inspire! Amanda Fenton (amandafenton.com) worked in the co-operative sector for nearly seventeen years with thirteen of them in Human Resources, including HR consulting, leadership and organizational development, change projects and collaborative strategic planning processes. She is a co-teacher of The Art of Hosting and The Circle Way, and is skilled in designing participatory gatherings using circle-based methods such as The Circle Way, Open Space Technology, World Cafe, Collective Story Harvest and others to host and harvest conversations for thoughtful change, working with non-profits, churches, schools, other organizations and networks. She is based in New Westminster, British Columbia, on the unceded territory of the QayQayt and Coast Salish people.